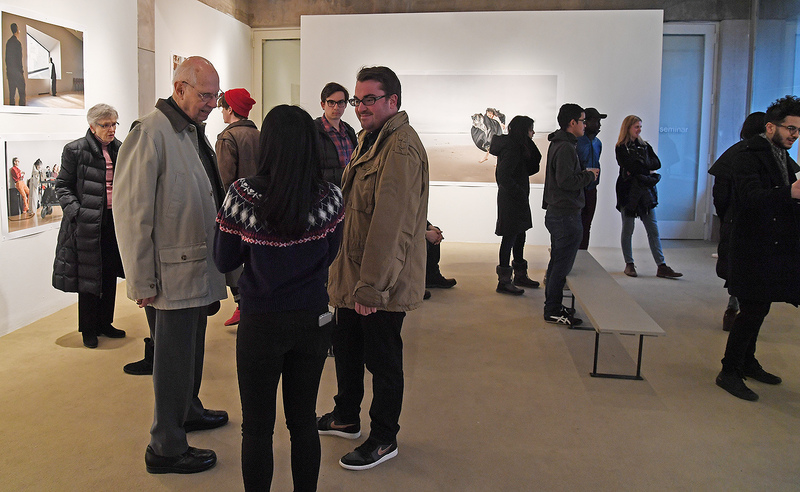 On Feb. 1, the Center for the Arts hosted a reception for A Body in Fukushima: Recent Work. The exhibition features photographs of dancer/performer Eiko Otake, the Menakka and Essel Bailey ’66 Distinguished Visiting Scholar in the College of the Environment, made by Bill Johnston, professor of history, professor of East Asian studies, professor of science in society and professor of environmental studies. On March 11, 2011, a tsunami and earthquake struck Japan causing three nuclear meltdowns at the Fukushima Daiichi Nuclear Power Plant in Japan. More than 15,000 people died as a result of the natural disasters and 34 died while trying to evacuate following the release of radioactive materials. 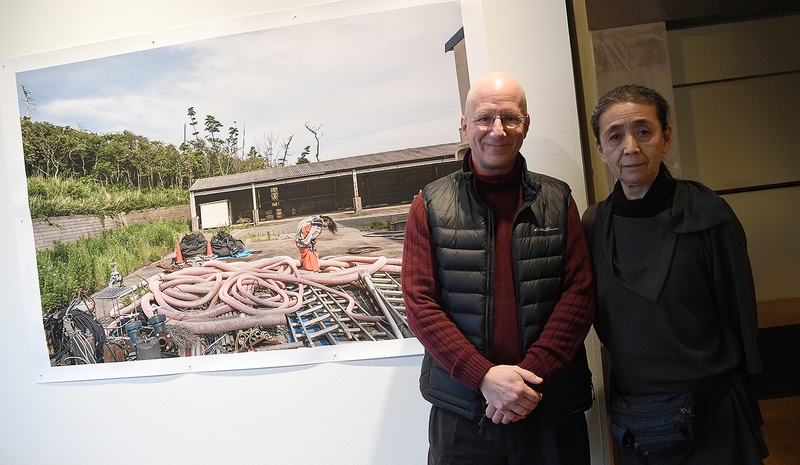 Since their initial groundbreaking exhibition of A Body in Fukushima in 2015, Otake and Johnston have visited Fukushima on two more occasions, in the summers of 2016 and 2017. 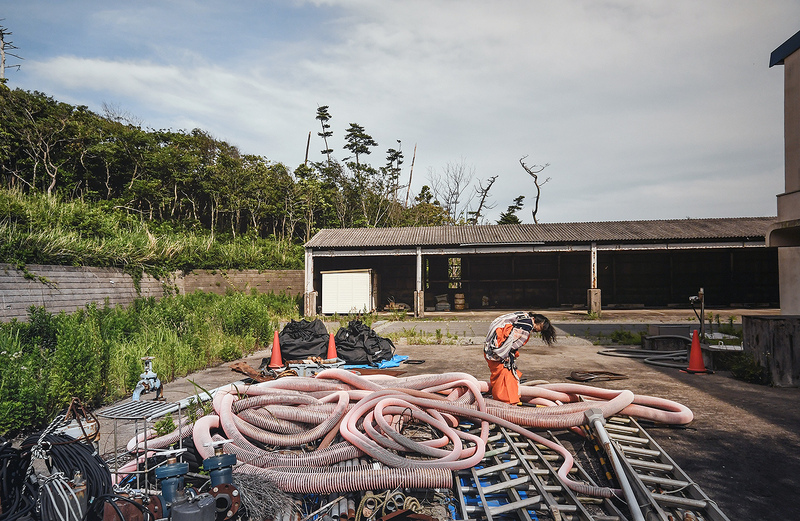 They witnessed the changing landscape after the earthquake, tsunami and Daiichi Nuclear Power Plant meltdowns of 2011. 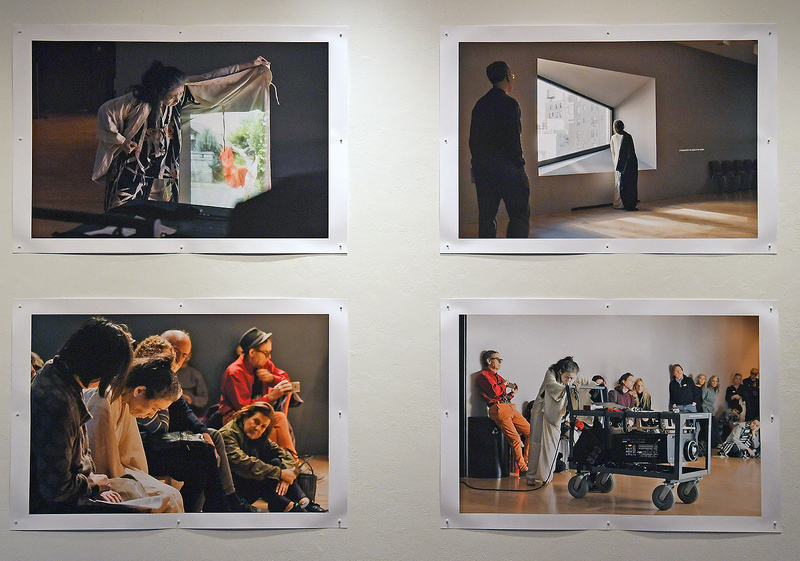 Johnston captures Otake’s movements and gestures as well as the evolving landscape. “By placing my body in these places, I thought of the generations of people who used to live there. Now desolate, only time and wind continue to move,” Eiko said. 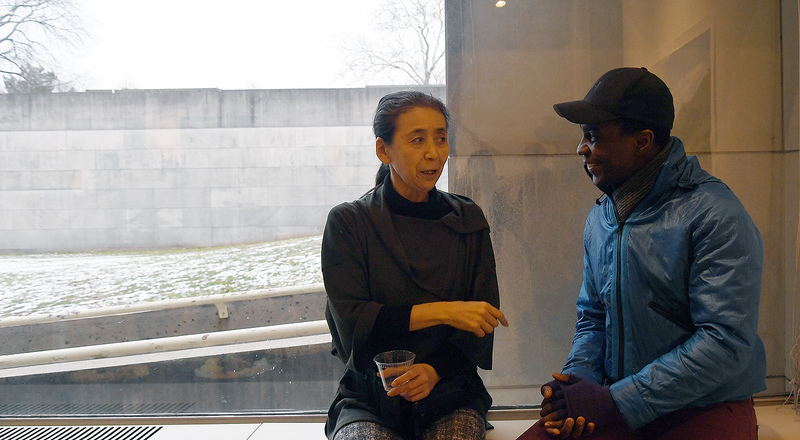 Eiko is a dancer and performer who has received numerous awards, including a MacArthur Fellowship, Doris Duke Artists Award, Guggenheim Fellowship, and Anonymous Was a Woman Award. Here, she mingles with a student during the reception. Last fall, Otake created a seven-and-a-half-hour video from thousands of Johnston’s photographs taken in Fukushima in 2017. She performed while projecting the video all day at the three different locations of The Metropolitan Museum of Art in New York. 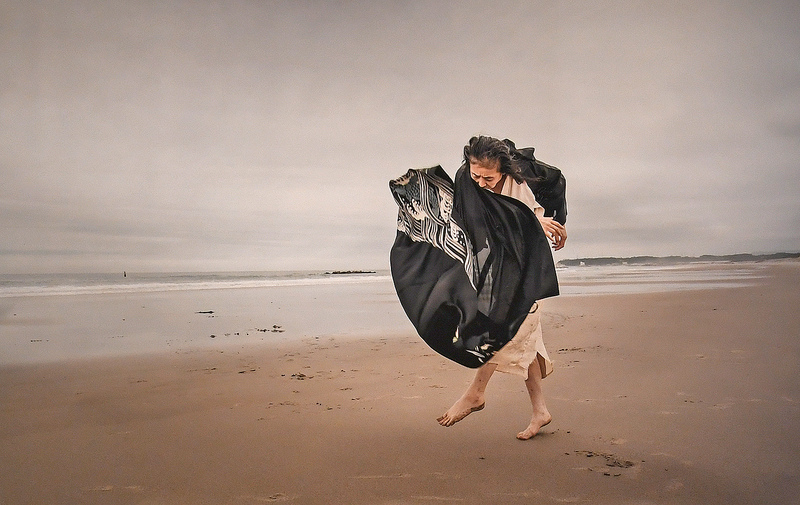 The current exhibition at Wesleyan features the newly edited Fukushima video and several large-scale prints of recent photographs of Eiko’s performances, both in Fukushima and at The Metropolitan Museum of Art in New York City. As part of A Body in Fukushima, Johnston photographed Eiko at the Namie Ukedo Beach on June 27, 2017. The Fukushima Daiichi reactors were located 3.5 miles south of the beach. Eiko positioned her body at the Tomioka Municipal Sanitation Plant on June 26, 2017. The plant is located 4.3 miles south of the Fukushima Daiichi reactors and was damaged by the earthquake. Most Tomioka residents had left the community due to radiation caused by the Daiichi disaster and the plant closed. 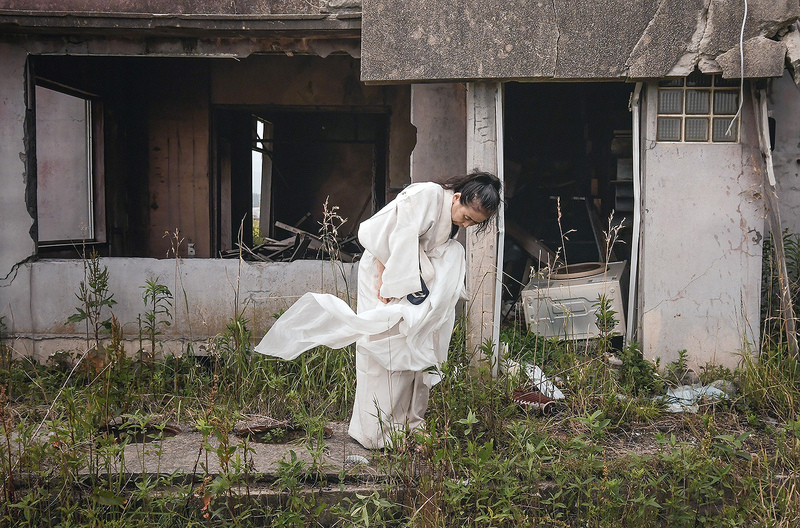 On June 27, 2017, Eiko explored the wreckage of a home four miles north of the Fukushima Daiichi nuclear disaster site. The home and the surrounding vibrant neighborhood was destroyed by the tsunami and then inundated with radioactivity from the Daiichi plant. 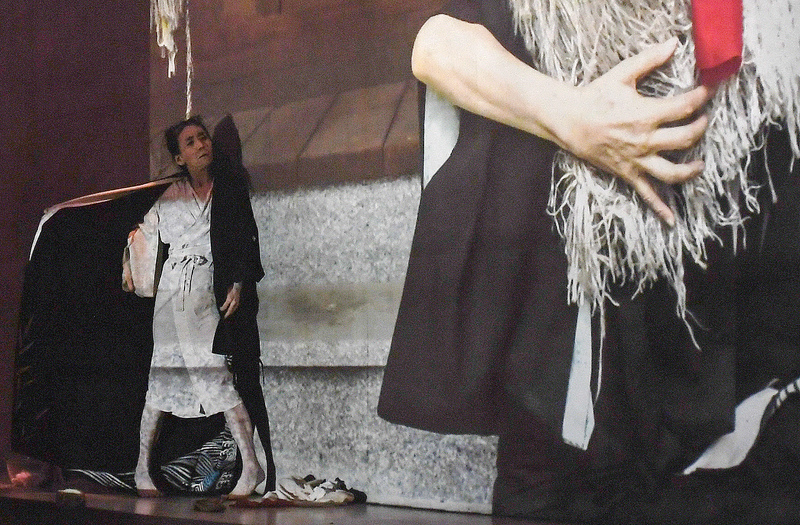 Eiko performed A Body in Places Nov. 12, 2017, at the Met Breuer, a contemporary art museum part of The Metropolitan Museum of Art. Eiko performed again at the MET on Nov. 19, 2017. Steve Angle, the Mansfield Freeman Professor of East Asian Studies, professor of philosophy, professor of East Asian studies, examines one of the prints. 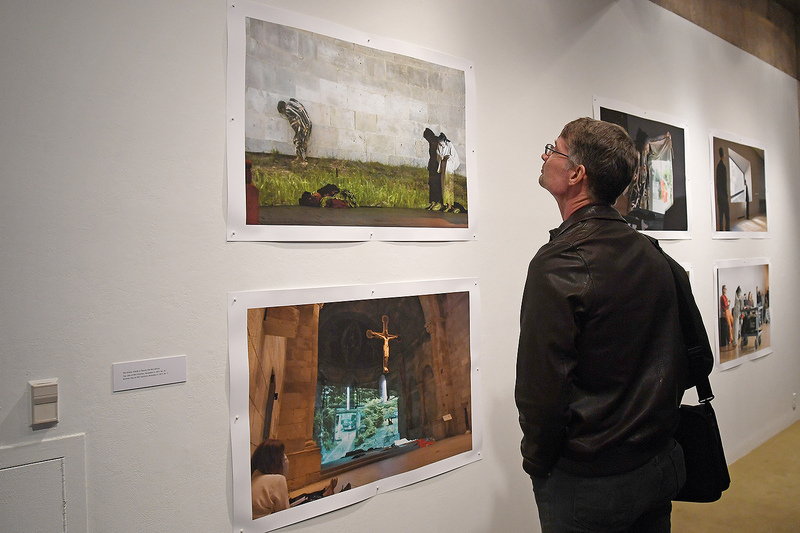 The photographs were printed during the 2017 Rauschenberg Foundation Residency to which both Otake and Johnston were invited. 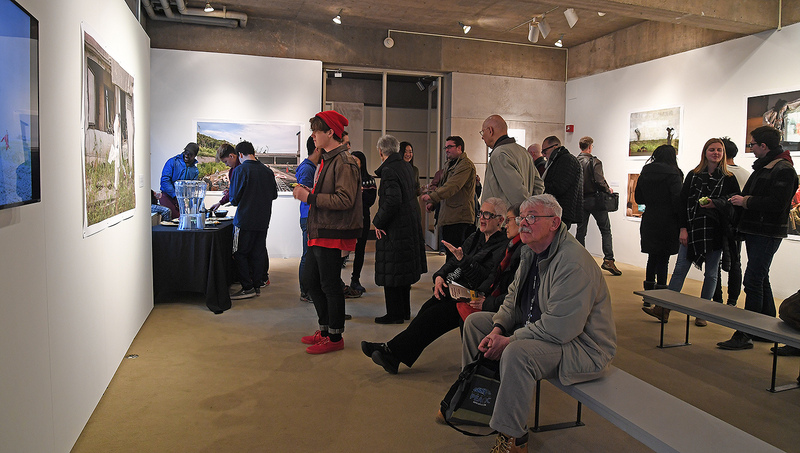 The exhibit is on display in the Ezra and Cecile Zilkha Gallery through Feb. 15 and is co-sponsored by the College of the Environment.